What Flavor Was The First Frozen Carbonated Beverage? Long before Play-Doh began its run as a decade-spanning iconic children’s toy, it had a far, far more mundane (and less colorful start) as a cleaning supply. 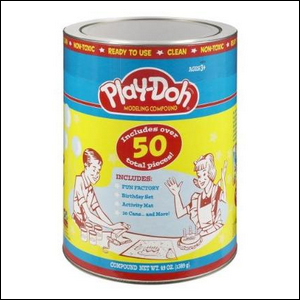 What would go on to become Play-Doh was originally a cleaning compound commissioned by the Krogers Grocery chain back in the 1930s. At the time, the majority of homes were heated by coal and that coal left a dingy coating on wallpaper. Cleaning wallpaper was a tricky affair as you didn’t want to wet it, and you didn’t want to disturb the surface with brushing or other aggressive techniques that could damage the surface. Enter Play-Doh’s forerunner, a simple clay-like compound made of flour, water, salt, boric acid, and mineral oil. You could take the clay and smoosh it against the wallpaper, peel it away, and it would lift all the coal soot without harming the wallpaper. It was cheap, effective, and sold quite well. After World War II, however, the market for soot-removal dried up as the country shifted to using natural gas for home heating, and the problem of sooty walls vanished along with the coal furnaces. Combine that with the introduction of vinyl-based wallpapers that could be easily cleaned with a damp rag and suddenly there was very little need for specialized wallpaper-cleaning clay. The company was, in fact, destined for bankruptcy until the nephew of the inventor discovered that local nursery schools used the clay to make Christmas ornaments and other projects. In that serendipitous moment it all came together: the clay was non-toxic, slow to dry, easy to mold, and a perfect fit for children. After a few adjustments to the formula (primarily to lower the salt content in order to keep the colors vibrant), an aggressive marketing campaign in the 1950s, and a push to international markets in the 1960s, Play-Doh became one of the world’s most recognizable children’s toys this side of LEGO blocks.